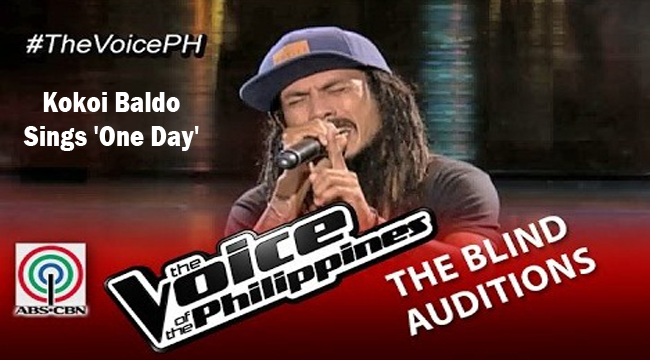 The 4th artist to enter the Blind Audition of The Voice of the Philippines Season 2 was Kokoi Baldo. Kokoi came from the island of Negros Occident, Bacolod City to be exact, and working as musician in Boracay performing in bars, etc. Kokoi during an interview said that his greatest inspiration for joining the audition was his family. Kokoi received a red envelope during a gig in Boracay. He did not have any idea that time that the red envelope that his wife was holding contained an invitation to join the Blind Audition. Kokoi was surprised and turned emotional that time. Usually, Kokoi is not fond of wearing slippers. He said that when he started playing in Boracay, he stopped wearing slippers in order for her body to have a connection with the earth. Kokoi’s genre was reggae and he performed “One Day” that made him popular. Many appreciated Kokoi’s performance and it was expressed by different individuals through tweets and status on Facebook. Kokoi was able to jam with the 4 coaches since APL De Ap asked for it. The 4 coaches who turned their chairs did their best to convince Kokoi to choose them but Coach Sarah emerged victorious on this and she was not expecting that the rasta lover will put his confidence on her.